Volterra is a town of great architectural interest located 1770 feet above the sea level, between the rivers Bra and Cecina in Tuscany, Italy. 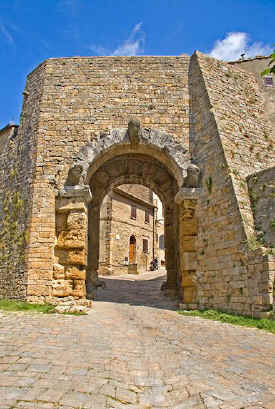 The main features are two fine castles and numerous Etruscan remains. 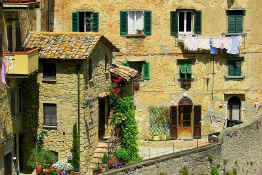 The ambience of Volterra is extremely attractive, easily rivaling that of the more famous Tuscan destination of San Gimignano. 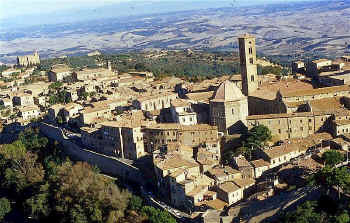 The novel and film of this name are set partly in Volterra. The film, starring Kristen Stewart, Robert Pattinson, and Taylor Lautner, whoever they might be, retains the setting, presumably to stay consistent with the novel and because the Volturi vampire clan take their name from Volterra. 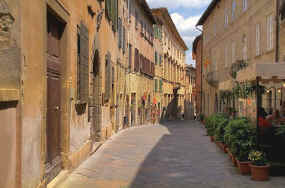 In fact, after a late decision, the "Volterra" location scenes were filmed in Montepulciano. Volterra stands on a rocky hill some 1770 feet above the sea level, located between the rivers Bra and Cecina, and is surrounded by strong walls. The district is rich in alabaster, the working of which was an important industry of the city, and in mineral waters, such as those of S. Felice and the Moie, or salt springs. Still more important are the Soffoni of Larderello, from which boric acid is extracted, the sulphur lake of Monterotondo, the copper springs of Caporciano, and the baths of Montecatini Val di Cecina. The Cathedral (duomo) of Volterra, consecrated by Callistus II in 1120, was enlarged by Andrea Pisano in 1254, and again in 1576. The high altar is adorned with sculpture by Mino da Fiesole. Among the pictures is an "Annunciation" by Luca Signorelli, and there are pictures by Benvenuto di Giovanni, Leonardo da Pistoia, and others. In the baptistery (1283) are a font by Sansovino and a ciborium by Mino da Fiesole. 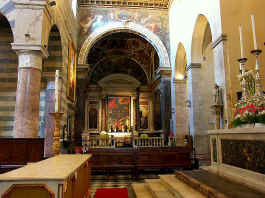 Other churches are those of S. Lino (1480) and S. Francesco. The Palazzo Publico (1217) holds the extensive archives of the city. The Palazzo Tagani houses an important museum of Etruscan and Roman antiquities. Travel Guide for Visitors to the Chianti Classico Wine Region of Tuscany, Italy. In the Etruscan period, Volterra, called Felathri by the Etruscans and Volaterrae by the Romans, was one of the most important cities in the Etruscan Confederation. From the period of the kings, it was at war with Rome. In 298 B.C., when he became consul, Scipio gained a victory here over the Etruscan armies. In the Punic Wars, however, the city was allied with Rome. In 80 B.C. it was taken by Sulla, after a siege of two years. 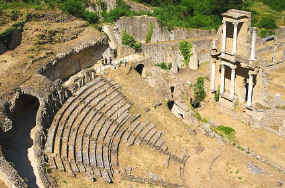 Remains of the ancient surrounding walls, including the Etruscan the Porta dell' Arco, may still be seen, as well as of baths, an aqueduct, an amphitheatre (see picture below), and, above all, of several Etruscan burial places. 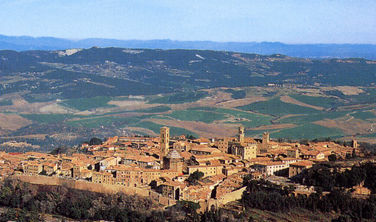 In the Carlovingian period, Volterra belonged to the Marquisate of Tuscany. With the approval of Henry, son of Barbarossa, the government of it afterwards passed into the hands of the bishop, until his temporal authority was suspended by the commune. 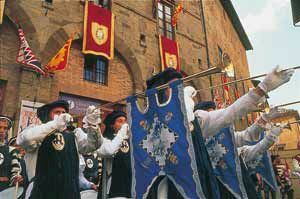 In the wars or factions of the thirteenth century, Volterra, being Ghibelline, was continually embroiled with the Florentines, who captured it in 1254, but obtained definitive possession of it only in 1361. 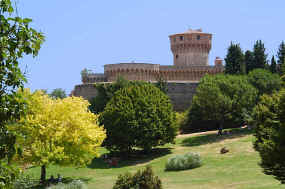 In the middle of the city rises the Rocca Vecchia, built in 1343 by the Duke of Athens and enlarged by the Florentines. In 1472, it attempted a rebellion against Florence but without success, and was then deprived of many of its rights. The richness of the Etruscan finds made in and near Volterra make it a mecca for enthusiasts of all things Etruscan, with an unparalleled collection of Etruscan antiquities being displayed in the Guarnacci Museum. For insight into the history and character of Italy and the Italian people during both Renaissance times and the 20th century, we strongly recommend the extremely readable books of Iris Origo. 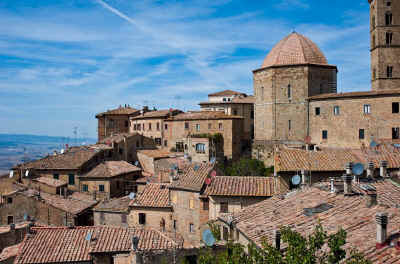 Volterra is the native city of the poet Persius Flaccus, of the humanists Tommaso Inghirami and Raffaele Maffei, of the painters and sculptors Baldassare Perugini and Daniele Ricciarelli. 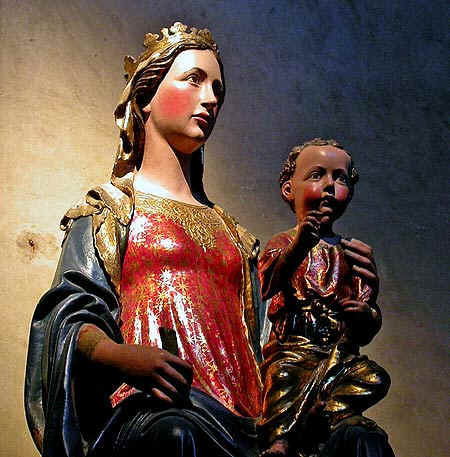 According to the "Liber Pontificalis", Volterra was the birthplace of St. Linus, the immediate successor of St. Peter. Nothing is known as to its Christian origins. Eucharistus, the first bishop of Volterra of whom there is any record (495), was deposed by the pope, and Helpidius (496) was put in his place. Justus (560) was at first involved in the Schism of the Three Chapters. Other bishops were: Gunfridus (1014), whose metrical epitaph is to be seen in the cathedral; Herimannus (1066), a Camaldolese monk and reformer of the clergy; Galgano, killed by the people in 1172, for some unknown reason; St. Ugo dei Conti del Castel d'Agnato (1173 84), a defender of the rights of his church, and founder of a college for the education of clerics; Pagao dell'Ardenghesca (1213), who vainly endeavoured to retain the temporal government of the city. The conflict on this score was continued under Pagano's successors, particularly under Raineri Belforti (1301). Roberto degli Adimari was deposed for taking part in the Council of Basle. Joseph du Mesnil (1748) died a prisoner in Castel Sant' Angelo. Giuseppe Incontri (1806) distinguished himself by his beneficence. Pius IX made his first studies in the Piarist College at Volterra. Rocca Nuova, one of two castles that dominate the town of Volterra. Vorresti pubblicizzare la tua attività su questo sito web per Volterra e ricevere traffico in entrata dalla nostra rete di più di 50 portali relativi? Clicca qui per ulteriori dettagli in merito alla nostra soluzione integrata per una presenza su internet pieni di successi. Bed & Breakfast rooms, Rome apartments, country villas in and near Rome. Click here for information on what to see and where to stay in Rome, Tivoli, Frascati and the Roman Campagna. 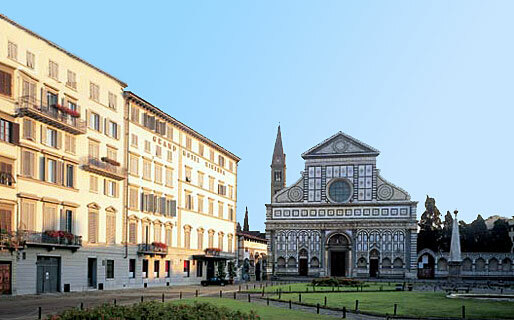 For a fine range of hotels throughout Tuscany bookable on-line - click here. 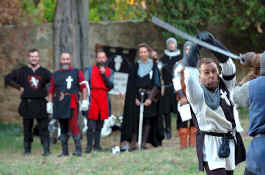 Offered via the most reliable on-line booking system in Italy.